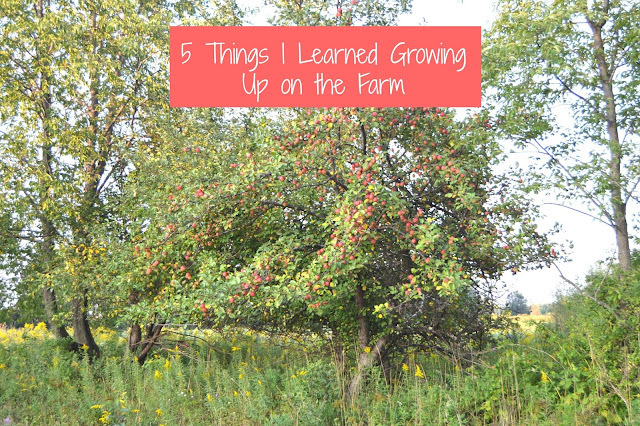 Since I started this blog over 5 years ago, I have written about my parent's farm. The farm has made quite an impact on my life and on my recent trip with the United Dairy Institute of Michigan, it got me thinking. We spent some time talking to the dairy farmer over dinner and it got my wheels turning about how much I learned growing up on a farm. My parent's purchased their farm when I was in third grade. For most of my life, we went up there every single weekend and on most school vacations (Christmas, February break, spring break and about 3 weeks in the summer). Although we did not live there full-time, we spent a ton of time there and it influenced me as a person a lot. Since we spent so much time at the farm growing up, all we had was each other. I spent a lot of time with my siblings growing up and got to be very close with them. We would play games, swim together, go on walks, watch movies, etc. I wrote about it recently in my post about siblings how I think that because we spent so much time together at a young age, we are now closer because of it. A lot of my friends in high school were getting into things that they should not have been. Being at the farm every weekend and away from everything, I avoided a lot of those situations. Looking back, I am thankful for this because I did not need to be drinking alcohol at 15 years old, having sleepovers with boys or driving to an unsafe part of Detroit at midnight. I talk about my dad's homegrown fruit all the time and it is really one of my favorite things ever. I LOVE fruit and vegetables and am thankful to have grown up around a lot of homegrown produce. My dad also rents out his land to a farmer who grows corn, soybeans and winter wheat. I feel like as a dietitian, I have a better understanding of food seeing it grown in our own backyard. From a young age on, we were taught to enjoy and appreciate the little things. A field of wildflowers. A homegrown wild apple picked while riding in the trailer of dad's tractor. Rides in the snow on a homemade sled falling off for the 100th time (all on purpose). Hanging out by the bonfire and looking up at the stars. An outdoor picnic with family. A swim in the pond on a hot day. I learned to appreciate and love nature. To my parents: I am very thankful to have grown up on the farm. I look forward to continuing to visit and bring my own family to the farm and I hope that they can learn some of the great things that I have. How great this picture is, and your white dresses are AMAZING!